Last year I had paid for a 5 race deal -- basically I got 5 races for $150 or so. One of the races, the half marathon in the series, was rained out due to torrential rain. So this year I had the opportunity to get a savings on the entire series again or run this year as a "make-up". I didn't sign up for the series this year on account I've been doing a few different races so I took advantage of a free weekend to do this race. 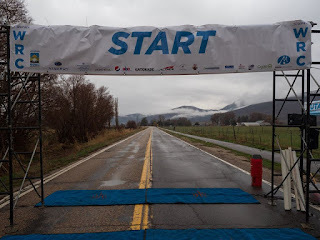 This race is put on by the fine folks who run the Ogden Marathon. 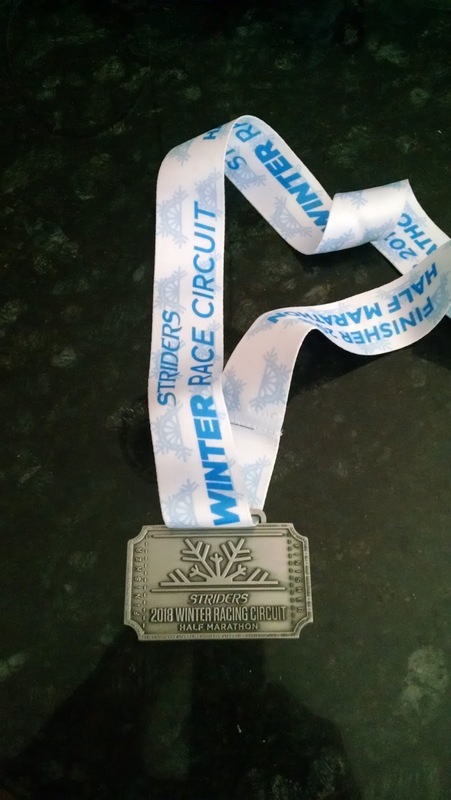 It is part of their winter racing series that is geared to get you ready to run the Full or Half Marathon in late May. The theory behind it is that if you can do the race series, you'll be in good shape to do the event in May. They discount the race pretty well, especially if you sign up for the package deal. I've done the series before and love them. This year threatened to be another rainy edition. Luckily the weather gods gave us a brief reprieve from the dire predictions of having to run a soggy half marathon. When I woke up on Saturday morning (I had totally set my alarm wrong -- so I could've slept right through it) I was anticipating the race to be canceled. I looked outside and it wasn't raining and the weather forecast indicated a light mist up north. I had gotten up a little past 4 AM, ate and was out the door by 4:45. I had packed just about anything I needed the night before, so I had a whole arsenal of running stuff, just in case. It was kind of funny actually. I was one of the first to show up and managed to get a parking spot and grab my bib. They were out of shirts my size so one is coming in the mail. I had about 15 - 20 minutes to kill before the buses loaded at 6:45. They had ample bathrooms at the finish and I took advantage of those. Around 6:55 or so, we took a 20 minute (or so) bus ride to the top. I apologize for a lack of photos. I was afraid of a downpour up there (it was drizzling / misting) and I didn't want to ruin my camera. In short, it was comfortable up there and I only had about 40 minutes to kill, which I did easily by cycling through the bathrooms and chatting up other runners. I had also carpooled with a runner friend of mine, so I was definitely not lonely. The race started at 8:05 as there was a technical issue with the timing at the finish. The first 4 miles or so of this road race are downhill. You are running near a roaring creek and it is just an awesome place to run. Check the photos from previous editions for pictures. Almost immediately, I felt off. My legs were sore and my stomach clearly wasn't happy. Like, let's just pull off to the side of the road, throw up and get it over with. I took advantage of the gentle downhill but I knew I was going to likely be in a world of hurt by the end of the race. In some ways, I just didn't want to race today. By mile 5 my stomach wasn't happy and I was almost considering dropping out. I just felt like s*t. It wasn't sickness, it was just overall tiredness. It took a lot for me to keep going but I knew I didn't want to wimp out and I wanted the cool medal at the end. This year's course was changed a little from previous editions. It also seems the Eden / Huntsville area has done a lot more with their bike trail system that hugs Pineview Reservoir. Despite my aching legs and the shuffle I was doing I was trying to enjoy the beautiful views. There wasn't much wind to speak of and a little mist kept me fairly cool. I had worn gloves, shorts and double tech shirts. I could've stuck with one shirt and been fine. I wasn't doing much passing after the 7 mile point. In fact, I was getting passed by a lot of people. Clearly, my legs weren't having it. I tried a gel at mile 5 and that perked me up some, but it didn't solve my problems. I carried my own fluids and used the ample aid stations, but I don't think it was a dehydration problem. I've just done WAY too much racing / running of late. The last 3 miles or so consist of rolling hills along the bike trail. You have the lake on your left and a little bit of road traffic to the right. I really wish I had more pictures -- it was just a beautiful day for a run despite the absence of sun. I thought about walking at this point but I told myself this wasn't an "A" race for me and just to get through it. Eventually, each step I took would bring myself closer to the finish line despite the burning sensation in my legs. I was never so happy to see the finish line and I sort of shambled over it, grabbed my medal and gear while hunkering down to wait for my carpool partner. At this point, the rain had picked up considerably. It wasn't a down poor but it was clearly raining (I think the race photographer bailed out at this point too). Well, this was my 5th half marathon in 6 weeks. I wasn't expecting much here at all with this race. All week I've felt flat and just downright sore and exhausted. There are some life issues going on and I have just worn myself out with running 40+ mile weeks and capping each week off with a half marathon. My performance was okay. I was hoping for a 1:55 as this is a fast course, especially the first 5 - 6 miles. However, I knew I'd be lucky to break 2:00 given the fatigue in my legs. I figured that a great racing performance wasn't in the cards within the first mile or two. The race had a ton of snacks and good coffee at the end. I grabbed a coffee and a protein drink and mingled with the runners. I talked with some of the stud runners there and they gave me some tips (lose weight). Overall, I loved the course and organization, as usual, was top notch. Just wish I had been in a more competitive mode to run well here.